Spitfire List | FTR #734 A Night in Tunisia, Pt. II: Are Karl Rove and WikiLeaks Working with the Muslim Brotherhood? FTR #734 A Night in Tunisia, Pt. II: Are Karl Rove and WikiLeaks Working with the Muslim Brotherhood? Posted by Dave Emory ⋅ February 6, 2011Post a comment Email This Post Print This Post Tweet This! NB: This description contains material that was not in the original broadcast. This program and description are inextricably linked with discussion in succeeding programs. Introduction: In the wake of the Tunisian uprising and attendant downfall of president Ben Ali, populist demonstrations and uprisings have manifested themselves in many Arab countries. This and future programs examine this phenomenon in conjunction with the actions of the WikiLeaks milieu and the ominous presence in Sweden of former Bush presidential adviser Karl Rove. Triggered, in part, by WikiLeaks disclosures and supplemented by online attacks by the Anonymous milieu, those demonstrations and, in the case of Egypt, popular uprisings may well have been part of an operation involving residual elements of the George W. Bush administration within the State Department, intelligence community and political establishment. 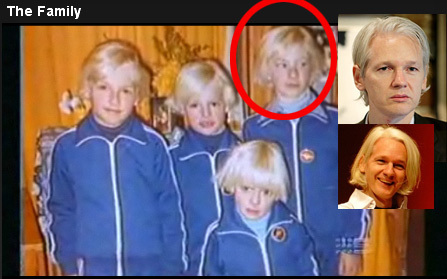 Assange as a member of "The Family"? Following what some analysts have termed “the WikiLeaks” revolution in Tunisia, analyst Robert Spencer noted the widespread approval of the Tunisian uprising by Jihadist/Muslim Brotherhood-linked elements throughout the Middle East. Hailing the Tunisian revolt as a “Jihad,” they see it as opening up the Middle Eastern political landscape to the ascension of fundamentalist elements. Although reassuring comments about Egyptian civil society are abundant in the media, available evidence suggests that the Muslim Brotherhood will be assuming a large role in the upcoming Egyptian government. The Obama administration appears to be positioning itself in such a way as to work with a Brotherhood-inclusive government in that country. In Tunisia, the Islamist leader has returned to the country, with opinion divided about whether his party can assume a theocratic preeminence over the rest of Tunisian civil society. Program Highlights Include: An Islamist suicide bomb attack in Sweden, conveniently timed to reinforce the political agenda of the Sweden Democrats; review of the financing of the Sweden Democrats by fascist financier Carl Lundstrom, who has also underwritten much of the Pirate Bay operations, themselves closely intertwined with WikiLeaks; review of the pro-Islamist sentiments of GOP bigwigs Karl Rove and Grover Norquist; review of the pro-Muslim Brotherhood sentiment in the trans-national corporate community. 1. The bulk of the State Department cables being accessed in the news media have come from Barack Obama’s State Department and have proved embarrassing to the Obama administration. It develops that Karl Rove is holding forth in Sweden, acting as an adviser to the Swedish Prime Minister. Media speculation has centered on the possibility that Rove may be aiding in Assange’s prosecution. Is Rove actually presiding over WikiLeaks’ operations in Sweden? Is the WikiLeaks’ leaking of State Department cables part of a Rove-directed covert operation?
. . . For at least 10 years, Rove has been connected to Swedish Prime Minister Fredrik. More recently, Fredrik, who is known as “the Ronald Reagan of Europe,” has contracted Rove to help with his 2010 re-election campaign. Rove was said to have fled to Sweden during the prosecution of former Alabama Democratic Gov. Don Siegelman, who believes his prosecution to have been politically motivated. “Clearly, it appears that [Rove], who claims to be of Swedish descent, feels a kinship to Sweden . . . and he has taken advantage of it several times,” the source added. Shuler’s source speculated that Rove could be trying to protect the Bush legacy from documents that WikiLeaks may have. “The very guy who has released the documents that damage the Bushes the most is also the guy that the Bush’s number one operative can control by being the Swedish prime minister’s brain and intelligence and economic advisor.” . . .
“Rove’s Hand Seen in Julian Assange’s Prosecution, Sources Allege” by David Edwards; The Raw Story; 12/20/2010. 2a. The subtitle comes from the recent Tunisian coup, that was inspired by WikiLeaks’ release of a cable that was critical of the regime of Ben Ali. Publication of WikiLeaks sourced private US comments on the corruption and nepotism of a hated “sclerotic” regime is said to have helped create Tunisia’s protest, and generated talk by US commentators of a “Wikileaks revolution”. “Tunisia: The WikiLeaks Connection” by Ian Black; The Guardian; 1/15/2011. 2b. It turns out that the Anonymous milieu (described in FTR #732) launched attacks against Tunisian government sites. Sites belonging to the Ministry of Industry and the Tunisian Stock Exchange were amongst seven targeted by the Anonymous group since Monday. Other sites have been defaced for what the group calls “an outrageous level of censorship” in the country. . . .
“Anonymous Activists Target Tunisian Government Sites”; BBC News; 1/4/2011. 3a. Initial reports on the coup described a possible role played by foreigners with blond hair and blue eyes, some carrying Swedish and some carrying German passports.
. . . Police said they had caught two men with Swedish passports after one of the shooting incidents, and state television quoted a security source as saying four people carrying German passports had been detained in the same incident. However, the Swedish news agency TT said the men were part of a Swedish group visiting Tunisia to hunt wild boar who had been attacked by a mob. . . .
“Tunisia Forces Fight Presidential Guards” by Tarek Amara and Christian Lowe; yahoo.com; 1/16/2011. 3b. Interestingly–and perhaps significantly–an earlier, [now] cached version of the story had a significant detail, which was scrubbed from later versions of the story. In this context, it is important to remember that there are ongoing operational links between Swedish and German neo-Nazis. In FTR #735, we examine the possibility that the coup will ultimately benefit the Muslim Brotherhood. Police said they had caught two men with Swedish passports after one of the shooting incidents, and state television quoted a security source as saying four people carrying German passports had been detained in the same incident. 4a. Conservative analyst Robert Spencer noted that the upsurge in democratic sentiment following the Tunisian uprising might lead to the empowerment of the Muslim Brotherhood. When Tunisian President Zine El Abidine Ben Ali was toppled from power and fled to Saudi Arabia on Friday, The Washington Post’s Jennifer Rubin hailed this “Jasmine Revolution” as a “remarkable event: a popular, secular revolt in a Muslim country” that “poses an opportunity and a risk for the U.S.” Mona Eltahawy, also writing in the Post, explained that “a 29-day popular uprising against unemployment, police brutality and the regime’s corruption” brought down Ben Ali. But there are numerous indications that there were other sources of dissatisfaction in Tunisia with Ben Ali — including the relatively secular character of the government. Pro-Sharia Islamic supremacist forces are poised to take advantage. Islamic Jihad held a rally in Gaza City, featuring hundreds of jihadists waving Tunisian flags festooned with the words “Revenge against tyranny.” Islamic Jihad spokesman Dawud Shehab sounded a drearily familiar note in accusing the Ben Ali regime of maintaining “suspicious ties” with Israel. Meanwhile, a PLO faction warned Tunisians about “waves of political Islam” that could follow Ben Ali’s toppling, and urged them to “cut the road to political Islam and its misleading slogans to avoid a repeat of the Gaza Strip experience in Tunisia” — referring to the seizure of power in Gaza by the Islamic supremacists of Hamas. The great unacknowledged truth about Tunisia and the rest of the Islamic world is that Islamic jihadists and pro-Sharia forces, far from being the “tiny minority of extremists” of media myth, actually enjoy broad popular support. Any genuine democratic uprising is likely to install them in power. That’s why jihadists are hailing events in Tunisia, and why all lovers of freedom should view those events with extreme reserve — for a Sharia government in Tunisia is unlikely to be any kind of friend to the United States, and if the “Jasmine Revolution” does indeed spread and other Arab and Muslim dictators are toppled, an already hostile anti-American environment could become much, much worse. The events in Tunisia also show yet again the crying need for realistic analysis in Washington of the jihad threat, rather than the fantasy-based analysis that prevails there now. But that is even less likely than the flowering of a pluralistic, secular democracy in Tunisia. “A Jihad in Tunisia” by Robert Spencer; Human Events; 1/18/2011. 4b. The Tunisian Islamist leader has returned from exile in the wake of the WikiLeaks/Jasmine Revolution. The leader of a banned Tunisian Islamist movement said on Saturday he would return in the next few days from exile in London after Zine al-Abidine Ben Ali, who ran the country for 23 years, was forced out. Tunisian authorities outlawed the Ennahda, or Renaissance, movement in the early 1990s after accusing it of a violent plot to overthrow secular rule. But the movement said it is non-violent and the victim of government repression. “I am going to go back very soon,” Rached Ghannouchi told Reuters in an telephone interview. “I haven’t decided when yet, but possibly in the days to come.” . . .
. . . Tunisia has had a strong secular tradition since its independence from France in 1956 and Islamist politicians have a much lower profile than in nearby countries such as Algeria or Egypt. There is some backing for moderate Islamist groups in Tunisia, but it is not clear how much because supporters hid their sympathies to avoid arrest. . . .
“Tunisia Islamist Leader to Return from Exile” [Reuters]; msnbc.com; 1/16/2011. 4c. Despite reassuring statements concerning Tunisia’s secular tradition, many observers feel that the Islamists will assume power there, eventually. There was also a looming wild card: the revival of the banned Islamist party. The government said that for now it would continue to block the return of the party’s exiled founder, while he repeated that his party espouses a moderate pluralism. Many Tunisians said they were waiting — some hopefully, some anxiously — to see what kind of rebirth the once-flourishing but long-outlawed Islamist political party might have. In a radio interview, Prime Minister Ghannouchi said that the exiled leader, Rached Ghannouchi — no relation — would be banned from the country until the government passed an amnesty law lifting a conviction he was given in absentia under the Ben Ali government. The exiled leader, meanwhile, made clear that his party envisioned a society far more liberal and open than Iran or Saudi Arabia. In an interview with The Financial Times, Rached Ghannouchi said his party had signed a shared statement of principles with the other Tunisian opposition groups that included freedom of expression, freedom of association and women’s rights. It remained unclear how much support he commands in the country. Some argued that Tunisian society today was too resolutely secular for the Islamists to find much support, after two decades of efforts by Mr. Ben Ali’s vast secret police to eliminate the party and cripple it. “They have people who are 50 years old or 60 years old, but they don’t have anybody under 40 because of the repression,” said Ahmed Bouazzi, an executive committee member of the largest opposition group, the Progressive Democratic Party. Others, however, argued that the religious convictions of Tunisians would assure the Islamic parties a strong base of support, especially away from the more cosmopolitan coasts. “Look, they will be easily the most popular party,” said one analyst who opposes the Islamists, speaking on the condition of anonymity to avoid angering family and friends. “No one can say anything against anything that is Islamic.” . . .
“More Officials Quit in Tunisia Amid Protests” by David D. Kirkpatrick and Kareem Fahim; The New York Times; 1/19/2011. 5a. A WikiLeaks leak indicated that elements of the State Department under George W. Bush were taking note of sentiment for removing Mubarak. This may have actually led to a slow-motion destabilization of Mubarak’s regime. For the last three years, the US government secretly provided aid to the leaders behind this week’s social uprising in Egypt aimed to topple the government of President Hosni Mubarak, according to a leaked diplomatic cable. One of the young Egyptian leaders who attended a summit for activists in New York with the help of the US embassy in Cairo was detained when he returned to Egypt, the memo released by Wikileaks said. The Daily Telegraph reported Friday that it and the secrets outlet were both hiding the identity of this young Egyptian leader. He was arrested in connection with this week’s demonstrations. The leaked document indicates that the US government was publicly supporting Mubarak’s government while privately backing opposition groups. . . .
“US Secretly Backed Egyptian Protest Leaders” by Nathan Diebenow; The Raw Story; 1/28/2011. The crisis in Egypt follows the toppling of Tunisian president Zine al-Abedine Ben Ali, who fled the country after widespread protests forced him from office. . . .
“Egypt Protests: America’s Secret Backing for Rebel Leaders Behind Uprising” By Tim Ross, Matthew Moore and Steven Swinford; Daily Telegraph; 1/28/2011. 5c. The Anonymous group has also undertaken to attack Egyptian government sites. The group’s Facebook page, called “Operation Egypt” carries messages about the Egyptian protests, and also a picture of a recruiting poster with an IRC channel as well as a “care package” to download. The rest of the page has news and updates from Egyptian and foreign sources. . . .
“Anonymous Asks for DDOS Attacks on Key Egyptian Sites” by Jesse Emspak; International Business Times; 1/26/2011. 5d. The Muslim Brotherhood has indeed been positioning itself to participate in the political process.
. . . ElBaradei, the former head of the U.N. nuclear watchdog agency, has gained a following among young secular democracy activists with his grassroots organizing. But some demonstrators dismiss him as an expatriate long removed from Egypt’s problems. Clinton suggested there were U.S. concerns over the possibility of the Brotherhood seizing direction of the movement. She warned against a takeover resembling the one in Iran, with a “small group that doesn’t represent the full diversity of Egyptian society” seizing control and imposing its ideological beliefs. . . .
. . . Egyptian security officials said armed men fired at guards in overnight battles that lasted hours at the four prisons – including one northwest of Cairo that held hundreds of militants. The prisoners escaped after starting fires and clashing with guards. Those who fled included 34 members of the Muslim Brotherhood, whose lawyer, Abdel-Monaem Abdel-Maqsoud, told the AP they were among scores rounded up by authorities ahead of Friday’s large demonstrations. The escapees included at least seven senior members of the group. State TV later reported that 2,000 escaped inmates were recaptured. . . .
“Egyptian Reform Leader Calls on Mubarak to Resign” by Hamza Hendawi and Maggie Michael [AP]; Seattle Times; 1/30/2011. 5e. The Brotherhood called for the dissolution of the Egyptian parliament. Egypt’s largest opposition movement demanded Wednesday that President Hosni Mubark dissolve the newly elected parliament and hold new elections, in a move that appeared to be an attempt to capitalize on the hopes for change sparked by Tunisia’s popular uprising. The Muslim Brotherhood also called for an end to Egypt’s 30-year-old emergency law that bans political rallies, and demanded sweeping constitutional amendments to allow free and fair presidential elections. The Brotherhood’s list of grievances is not new, but the demands appeared to be aimed at seizing on the momentum triggered by the revolt in Tunisia that toppled the country’s authoritarian president and galvanized opposition movements throughout the Arab world. “The events in Tunisia are a cornerstone for the rest of the people of the Arab and Islamic world,” the Brotherhood said in a statement posted on its website. “It is a message to all the despotic leaders and the corrupt regimes that they are not safe and they are living on the tip of a volcano of people’s anger and God’s wrath.” . . .
“Egypt’s Muslim Brotherhood: Dissolve Parliament” [AP]; The Jerusalem Post; 1/19/2011. 5f. The Obama administration’s State Department is positioning the U.S. to cooperate with the Brotherhood. As it braces for the likelihood of a new ruler in Egypt, the U.S. government is rapidly reassessing its tenuous relationship with the Muslim Brotherhood, an opposition movement whose fundamentalist ideology has long been a source of distrust in Washington. Although the group has played a secondary role in the swelling protests that are threatening to topple President Hosni Mubarak, U.S. officials have acknowledged the political reality that the Muslim Brotherhood is poised to assume at least a share of power should Egypt hold free and fair elections in the coming months. The move drew the skepticism of some U.S. officials who have argued that the White House should embrace opposition groups that are more likely to support a democratic government in Egypt, rather than one dedicated to the establishment of religious law. It also marked a change from previous days, when Secretary of State Hillary Rodham Clinton and other officials expressed concern that the uprising in Egypt could shift power to an Islamist government much like the one in Iran, where ayatollah-led factions elbowed aside other groups to seize control of the country in 1979. Officially, the U.S. government has long shunned the Muslim Brotherhood because of doubts about its stated commitment to non-violence and democratic principles. For years, however, U.S. officials have engaged in back-channel talks with Egyptian members of the movement in recognition of its substantial popular support. The unofficial contacts have taken place sporadically since the 1990s but became more frequent after members of the Brotherhood were elected to the Egyptian Parliament in 2005. Afterward, U.S. diplomats and lawmakers held several meetings with Brotherhood leaders, including at the U.S. Embassy in Cairo. . . .
“U.S. Reexamining Its Relationship with Muslim Brotherhood Opposition Group” by Craig Whitlock; The Washington Post; 2/3/2011. 6. In a slight digression from the topic of WikiLeaks and Karl Rove, the discussion highlights the fact that Sweden’s Sweden Democrats (the Swedish equivalent of the British fascist group the BNP benefitted from an Islamist terror attack in this precise time period. The bombs had barely exploded in Stockholm’s bustling shopping district before members of the far-right, Islam-bashing Sweden Democrats rushed to their blogs and Twitter feeds. “Told you so,” said one. “Finally” tweeted another. The government and just about every editorial page has warned against blaming Sweden’s growing Muslim minority for the Dec. 11 suicide attack carried out by an Iraqi-born Swede, who appears to have been radicalized in Britain. But the far-right fringe is doing just that in another challenge to Sweden’s famed tolerance, already frayed in recent months by the Sweden Democrats’ entry into Parliament and a serial gunman’s sniper attacks against people with dark skin. Authorities say there’s a risk that even more extreme groups, long marginalized in Sweden, will use the opportunity to advance their positions. “The biggest worry isn’t that the Muslim community will become radicalized but what this means for the view of Muslims in Sweden,” said Erik Akerlund, police chief in Rinkeby, an immigrant suburb of Stockholm nicknamed “Little Mogadishu” because of its large Somali community. While investigating the attack, the Swedish security service is also keeping an eye on any potential reaction from right-wing extremists, said Anders Thornberg, the agency’s director of operations. Those groups have kept a low profile since a series of attacks on immigrants and left-wing activists in the 1980s and ’90s. The suicide bomber, Taimour Abdulwahab, killed himself and injured two people when some of the explosives he was wearing exploded among panicked Christmas shoppers in downtown Stockholm. . . .
“Suicide Bombing Stirs Sweden’s Far-Right” by Karl Ritter [AP]; The Huffington Post; 12/16/2010. It is incredible the amount of information you manage to put out in a single post! Even if I have my own blog now, your show and your site are so good that I can’t resist to write a commentary. I have a few things to say. The events in Tunisia and Egypt smell fascism all over the place. One has to be naive to believe they really are ‘democratic’. I have put together everything that I know that is valuable to help each other fight back. It is only by reaching out to one another and working together as a group that we have a chance to defend progressive ideas and solutions and stop this slow descent into barbarism. I loved your analogy of the Mensheviks and the Bolsheviks in Russia. I included it in my post as a metaphor. Keep up this fantastic work! Let all the progressive unite and work as a group for mankind’s sake. I love your work; I’ve been following for two years since I was twenty. It has really influenced me as a leftist and an activist. As much as I trust you and heed your warning, as a member of Anon and of CPUSA I have to continue this fight for democracy despite the possible consequence that this may invite fascism to Egypt. Every revolution leaves the people vulnerable to exploitations. The Soviets were forced to create a single party system because of this problem following the start of the revolution. The people of Egypt must organize themselves by allowing the kind-hearted to do so. It’s a risk they have to take in their efforts. If they succeed it’s their obligation to keep the Muslim Brotherhood out of their affairs. If the Brotherhood succeeds it’s up to the people to continue to revolt. If I chose to stop the DDOS attacks they would continue without my help and if I were to introduce Anon to your analysis in order to express concern you’d probably be next for speaking against them. Of course, I would never do that, of course. I cherish your work as much as you do. When this fight is over and the conclusions are unfavorable I really hope you can forgive that, but if you’re speculations are wrong I’ll be at rest and embrace the victorious and guiltless experience that comes from knowing that I assisted in the civil disobedience that assisted a people’s liberation from government oppression. @Delegate Zero: Hello, friend…….you’re in Egypt? Anyway, I’ll cut to the chase: I, too, worry about fascism taking over that nation, but I’m also convinced that sooner or later, democracy will win there. And people like you will be rightfully known as heroes of sorts for your work, even if things don’t turn out well at first. I won’t call this an apology or a retraction although it has elements of both. Perhaps the best word is ‘mollification’ of my earlier comments about your analysis of the overall confusions presented in FTR#735 and the rest of the material that is proceeeding from that. I’ve have, over the years, studied your entire priceless archive, often revisiting certain topics more than once or twice. I’ve downloaded and studied most, not all, of the books on your site. In short, in reviewing sections concerning Libya and the Mediteranean in general, especially the Terpil-Wilson material, in combination with looking at some others’ scepticism surrounding Wikileaks, Google, etc., I see no way you can have presented this material and your irreducibly complex, ongoing theses in any more cogent fashion than you have done. In short, ignore what I said and keep on keeping on, Dave. My best wishes. CAIRO: The Anonymous organization of hackivists has leveled a new threat against Egypt’s largest political group, the Muslim Brotherhood, saying it would take down the group’s online capacity. In a Youtube.com video, Anonymous said that the Brotherhood is a “threat to Egyptian soveriegnty” and must not be allowed to work against the revolution that ousted former President Hosni Mubarak in February. The video stated that the Islamic group was not part of the revolution and is attempting to co-opt the Egyptian population. “Ever since its revolution that shook the world, Egypt has had its fate undecided. Predators who seek to control are waiting to strike at the right moment. They are waiting to take over the country and make it so that another revolution is impossible. We cannot allow this,” said the group. Anonymous is known for taking down websites across the globe, including intelligence sites and governmental organizations online status. “The Muslim Brotherhood started as a benevolent group of people with fair and just intentions. However, as decades went by, corruption seized its mission of good and turned it into a power-hungry organization bent on taking over soverign arab states in its quest to seize power from them,” continued the statement. Anonymous said they would not allow the Brotherhood to create an Islamic state in Egypt. They likened the Brotherhood to the Church of Scientology and Freemasons, in its structure and alleged adherence to vows. yeah, I’m hoping the Anonymous folks running this operation read up on the MB’s entire history, because that’s one of the most potent tools Anonymous will have in a campaign like this. The Egyptian public has a massive choice to make very soon about whether or not to follow the MB’s proposed path out of military dictatorship (into a nice sham democracy/de facto theocracy). And that public should recognize that that they are not simply choosing a society centered around some unelected MB Imams’ interpretation of Shariah law getting turned into public policy. It’s Shariah law in the social realm and faux-free-markets/fascist crony-capitalism in economic affairs. Their history going all the way back to the beginning is infused with scary fascist-style capitalist theology (which is played out as a rhetorical adherence to free-market ideology coupled with a mafia-state sub-infrastructure to keep the cronyism going). The MB was always, in part, an elite-MBA-Islamist movement, and Egypt’s public had better recognize that very soon because elite-MBA faux-democratic crony-capitalism hasn’t exactly had a great run in the “developed” world. I’m not sure adding an Islamist flair to the mix is going to make elite-MBA faux-democratic crony-capitalism a workable model. Khairat al-Shater is no ordinary Egyptian businessman. The tall, bearded owner of an array of trading and industrial companies is the deputy leader of the Muslim Brotherhood and has spent the past two decades in and out of jail. Known as a financier of the Islamist group as well as one of its leading strategists, he was a prominent target for imprisonment by the regime of Hosni Mubarak, the ousted president who relentlessly fought the Brotherhood. Today, as Egypt enters a new political era in which the organisation is poised to play a key role, Mr Shater is keen to assure investors that the Islamists favour a free-market economy and would keep the country open for business. Peppering his words with religious references, he argues that Islam supports a free-market economy, but one in which the profit motive is constrained by considerations of social justice. His diagnosis of Egypt’s economic problems – Standard & Poor’s cut the nation’s credit rating on Tuesday – and his proposed remedies, including better education and support for small and medium-sized enterprise, do not appear to depart from mainstream economists’ views. An international banker who met Mr Shater recently says the Islamists’ economic agenda seemed more “thought-out” than that of other parties. Although the Brotherhood doesn’t question pro-business measures taken under Mubarak, it does object to the social injustice that resulted. El-shater’s own status helps. His businesses range from furniture to clothing to bus assembly to pharmaceuticals. He estimates that they employ 2,000 people. CAIRO (AFP) — Egypt’s ruling National Democratic Party on Sunday sought to reassure members at its annual conference that the benefits of economic liberalisation would eventually trickle down to the poor. Opening the conference’s second day, Gamal Mubarak, party assistant secretary general and President Hosni Mubarak’s younger son, emphasised that reforms were not merely for the benefit of the country’s rich and powerful. “The party stresses its commitment to social development highlighting the principle of social justice,” Mubarak told the 6,700 delegates. Even as Mubarak junior listed priorities of housing, water and sewage services, other ministers sought patience from delegates voicing their concerns about growing poverty and unemployment. “There is an unlucky segment of Egyptian society that does not feel the benefits of economic reform,” Finance Minister Yussef Boutros Ghali said. “Twenty percent of Egyptian people do not know how to deal with the mechanisms of the market,” he said, adding that the government would be paying special attention to that percentage. Something tells me patience is going to be quite a publicly exalted virtue in Egypt going forward. Yay. Trickle-down compassionate conservatism for everyone.